Thank you, Lord, for bringing us together and for the gift of our love which has already brought us so much joy. Grant that we may always continue to love each other with reverence, patience and generosity. In the hurried days of the final preparations, grant us the calmness to reflect on the moment when you will seal and sanctify our promises, binding us together in your love forever. Congratulations on your decision to get married. It’s one of the most important decisions of your whole life. 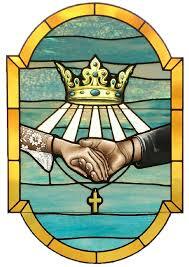 Your desire to marry in Church is your invitation to Christ to be at the heart of your relationship. The Christian community wishes you every blessing and happiness. We are delighted that you have chosen to get married here in our parish. We will make every effort to facilitate your celebration and to make your wedding day a very happy, holy and memorable one. To assist you prepare for your wedding in our parish we have compiled a Marriage Booklet. We hope that this guide will be of assistance to you in your preparation for your wedding day. The priest celebrating your Wedding Mass will help you choose readings, prayers and The Rite of Marriage. We have compiled some Readings, Prayers and Reflections to assist you . Finally, may we wish you both a well deserved holiday/honeymoon after all these hectic preparations for what we know will be a fantastic Wedding Day. We also wish you God’s blessing and joy for what we trust will be a very long and happy married life together.